A bad car crash in 2004 threatened Lynn Chenier’s life and she needed 12 units of blood to survive multiple operations. Rehabilitated and working in Victoria as a local mindfulness coach and health consultant, Chenier is now ready to give back. On Tuesday, Chenier engaged the donor registration process at the Canadian Blood Services centre on Saanich Road. However, the stroke she suffered during the car crash was marked as a red flag, and she’ll have to wait another week to get medically cleared so she can donate. Meanwhile, the holidays are just another time of the year the Canadian Blood Services are in need of donors. 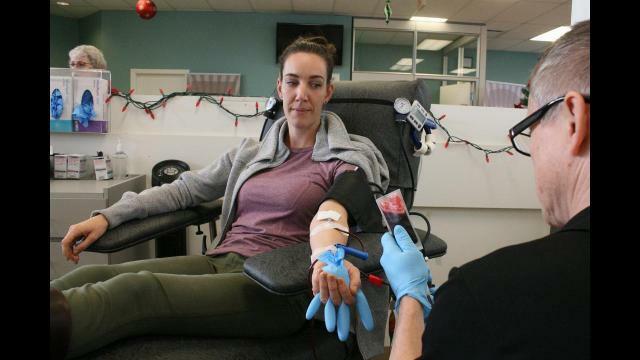 “[Only] 50 percent of Canadians are eligible to donate and only four per cent actually donate so it’s a [big gap] in the statistics we have to fill,” said Ann Chabert, territory manager for the Canadian Blood Services. “People are shopping, people are thinking about family gatherings, so it’s not always on top of mind to think about people spending their time at the hospital, so if you have an hour it would make a life changing difference. Chenier’s not the first blood recipient to give back in thanks. Chenier was in a serious motor vehicle collision on Highway 401 in Gananoque, Ont., in 2004, shen whe was driving home to Toronto from a family visit in Cornwall. She suffered multiple orthopaedic injuries when and received a dozen units of blood while undergoing numerous surgeries over several weeks. Earlier this year Scott Adams, who needed 40 units of blood to survive being struck by a car, prepared a lunch buffet of smoked chicken, smoked beans and more, which he served outside the blood donor clinic on Saanich Road.